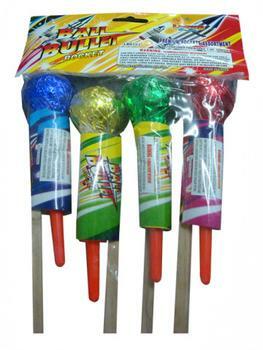 Miller Fireworks of Holland, Ohio, is recalling about 3,800 ball bullet rocket fireworks. The fireworks are overloaded with pyrotechnics intended to produce an audible effect, violating the federal regulatory requirements for this product. Overloaded fireworks can result in a greater than expected explosion, posing burn and explosion hazards to consumers. This recall involves ball bullet rocket fireworks packed in bags of four with model number LB6103 and M-150 cracker fireworks packed in boxes of 36 with model number LA150B. The model numbers are printed on the packaging. The fireworks, manufactured in China, were sold at Fremont Fireworks stores in Indiana, Miller Fireworks and J&W Fireworks stores in Ohio and Red Falcon Fireworks and Rocky’s Fireworks stores in Michigan from May 2017, through June 2018, for between $4 and $13. Consumers may contact Miller Fireworks toll-free at (833) 474-1776 from 10 a.m. to 5 p.m. (ET) Monday through Saturday, by email at sales@millerfireworks.com or online at www.millerfireworks.com and click on “SAFETY” at the top of the page for more information.